I will always remember July 2015 as the month I finished my DT Matrix and I met James Bond! 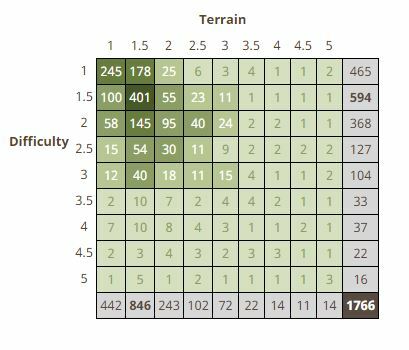 I had been working on finishing the DT grid for quite a while and the last few combinations needed were really proving difficult to achieve, partly because of lack of time to commit to going for higher terrain caches or finishing off other challenges to get the DT I needed and also partly because one of them seemed impossible to get without planning a holiday somewhere or doing numerous difficult hikes to get a challenge cache. 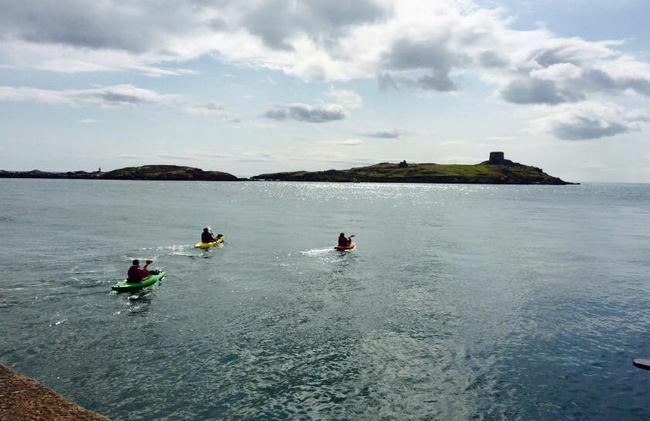 Silver soldier was also working on his grid and he suggested to me it might be fun to be celebrating finishing the grid together at my Dalkey Island event on 11th July. So I got my head down and did some serious strategic caching so I could finish it off. In the end, I got my last DT (5/4) on 8th July at Under the Bridge (GC5HDHE), and I enlisted the help of THE_Chris and Donnacha. Lucky too, as the cache is hidden quite high up and despite me bringing along my step ladder, I couldn’t quite reach it. Chris stepped up and retrieved it and I did a little Fizzy dance once our names were in the logbook! 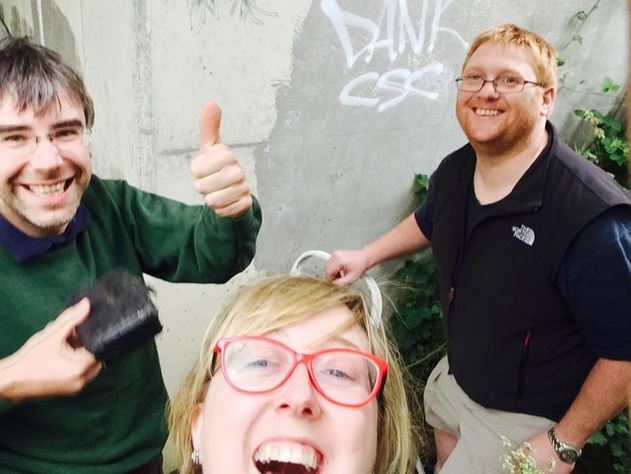 Under the Bridge selfie with THE_Chris and Donnacha – look how pleased I am with myself! 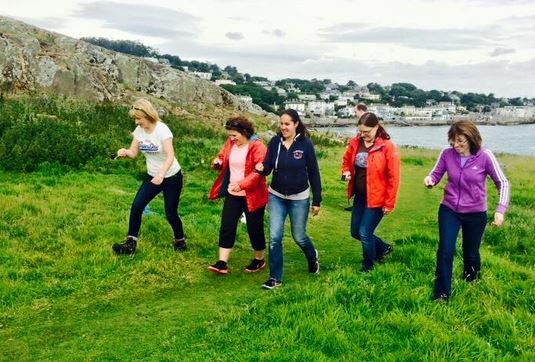 Quite a few months back, I put a post on the Geocaching Ireland Facebook page asking would there be any interest in an event on Dalkey Island in the summer. The feedback was a resounding yes! I had initially planned on having the event on 4th July but it clashed with other events so I moved it by a week and AbbeyAckbar suggested I add in the Groundhog Day part so I could keep my American theme. As the day drew closer, the ‘Will Attends’ were flooding in, which I was pleasantly surprised with. I was in contact a few times with Ken the Ferryman and when I called him the day before to check if he’d be sailing, he told me I’d have to call back in the morning to check again. At this stage I was panicking; there was a small craft warning in place and I thought we might not get to the island. Thankfully, I was given the go ahead by Ken early the next morning so it was all systems are a go! The majority of the group got the ‘ferry’ (read: small motorised boat) and the sheer numbers overwhelmed both me and the ferryman so it took a while everyone out there, despite the fact the groups were only in the boat for a few minutes each time. We also had three kayakers and one brave soul in an inflatable boat (he made it there and back – fair play kryten2x4p!). I was almost in the last boat going over. 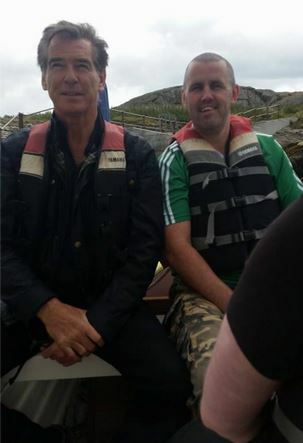 Pity I didn’t wait for the last one though, as we had an unexpected special guest: Former 007 himself, Pierce Brosnan. As soon as I heard he was on the island, and after seeing RGK76‘s photo as proof that he wasn’t having me on, I made my way over to him and asked would he come over to the group but he politely and firmly said ‘no’. So that was that. 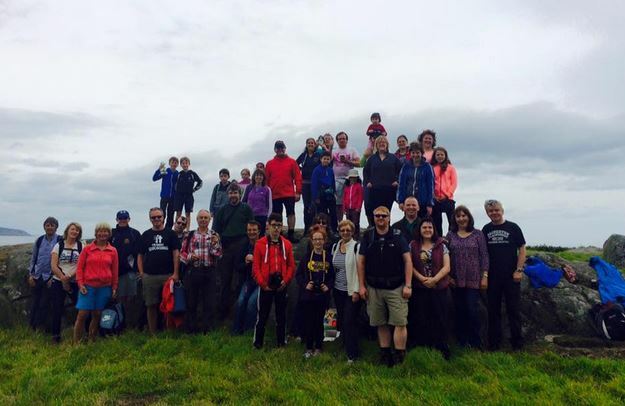 Some lucky geocachers did get their picture taken with him though! 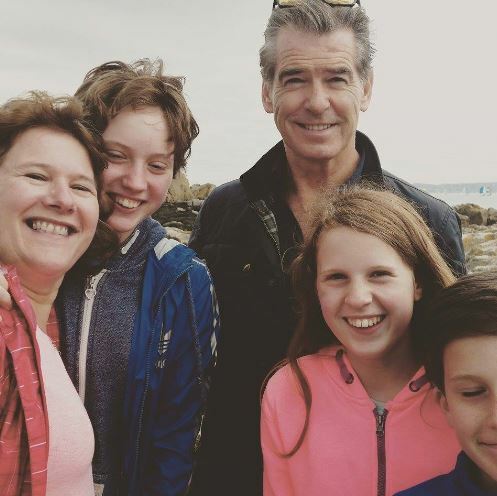 Casseill with Mr Bond – their story got picked up by the official geocaching blog! This was the most well attended event I’ve ever hosted and I’m hoping to make it an annual affair – maybe next year we’ll have a barbecue on the island, who knows? I’ve already started trying to organise a celebrity for next year! I’m thinking Hugh Jackman, since we know he’s already a geocacher! A partial group shot – some of the group had already left by the time I remembered to take the photo! Last weekend, I attended the UK Mega in Essex but I’ll have a separate post for that in the next week or two. I’m less than a week away from a year of caching every day – it will be surreal not to have to go caching for once! Great event. I’m still waiting for Hugh Jackman to turn up to one of ours 🙂 We had a CITO last week and someone found several bags full of cow legs! Well, let’s put it this way, he was since stopped at the airport with a hunting knife in his hand luggage – he didn’t whip that out and tell me no ? ?